How annoying can a robot become? “Human resources teams know how to manage man-to-man. There’s disquieting news coming out of Winnipeg about a humanoid robot that bullies office workers to do more. Seems the machine is able to get humans to continue doing mind-numbing renaming of digital files by the hundreds long after the point at which humans should have wised up to the test ruse. Researchers were surprised at how compliant and obedient humans were. Young is studying how people and robotic systems work together, which will undoubtedly become very important in workplaces of the future. Just when that future will arrive is speculative. However, if sales are any indicator, it could be sooner than expected. Sales of professional service robots, those that interact with humans in the workplace, are on the rise. In 2016, 40,000 were sold for $4.6 billion. The International Federation of Robotics forecasts an increase to about $46 billion from 2016-2019. 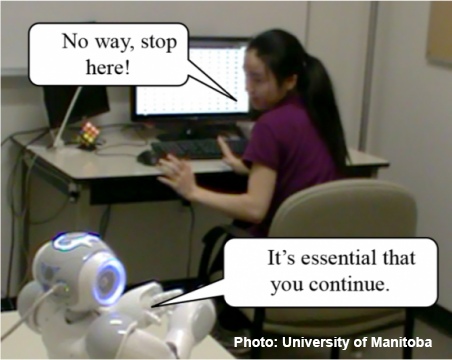 The University of Manitoba research has revealed some important issues and challenges ahead for human-robot interaction while on the job together, especially if the robot is a manager or supervisor of human workers. “We’re curious about the social pressure this robot is putting on people,” revealed Young in a recent interview with the Financial Times. Long term interaction between robots and humans may well pose a whole new set of issues for the workplace. A Japanese study from the Journal of Advanced Robotics looked at lab rat behavior when antagonized by a mobile “roborat” that continuously tormented the trapped rodents. Over time, all the “roborat” had to do was feint an aggressive move at his cage mates in order to paralyze them with fear. Is there a robot-human parallel there? Of course, the University of Manitoba study was one-off research without any longitudinal component like that of “roborat”. The question there might be: Over time, would conditioning of humans acceberate Young’s one-off findings or would humans quickly learn to adjust and adapt? The end result for the victims of “roborat” was severe depression which was alleviated by medication. In a nutshell, Cooper’s summation seems right on point: “Employers’ first step in integrating the two [human and robot] should be to acknowledge the scale of the change it represents. The news in from Winnipeg is that this “different era” has a learning curve that we’ve only begun to realize. Is this a case of déjà vu all over again? Are we reliving through the robot what we previously experienced with computers, when they first began tormenting the workplace? In the 1950s, mainframe computers, like so many alien spacecraft, settled into the financial departments of major corporations, and in so doing, scared the hell out of thousands of accountants and payroll clerks. Even Hollywood got into the fun of it all with whimsical romance stories that had mainframe co-stars. Walter Lang’s Desk Set (1957) was one. Starring Spencer Tracy and Katharine Hepburn and a mainframe named EMERAC, the movie captured the travails of workers suddenly caught up in and dealing with their techno-fear at the Federal Broadcasting Network. People got over it fast, but then came fear of PCs. Yes, fear of PCs. Hard to believe, but it’s true. Substitute the words “personal computer” with that of “robot” and the snippet begins to sound a lot like the robot angst that we read about today. The timeline between EMERAC and the PC—about twenty years, give or take—seems about right as well. We are looking at a two decade span of what Cooper calls “a different era” during which we’ll encounter, by degrees, the full force and effect of robots disrupting the workplace. The changes that will take place will be non-trivial, but we’ll come out the other side, just like we did from mainframes to PCs, the better for the journey.